I had been recommended Mildreds as an amazing Vegan/Vegetarian restaurant to try out by dozens of people, so when I finally got the chance to go, I had a built up a pretty fantastical expectation of how it would be in my head… And I was not disappointed! After a visit to the Soho restaurant on Lexington street one lunch time with a colleague (which was lovely, but it was very small & very busy, and the food took a little longer than we hoped to arrive), I went to the Camden branch a few weeks later. First with my mum when she came to visit the new flat I’m living in (with lovely housemates and 2 adorable cats, but more on that another time) and then a second time more recently with a friend. I was over the moon to find out it was as lovely & delicious as everyone said. 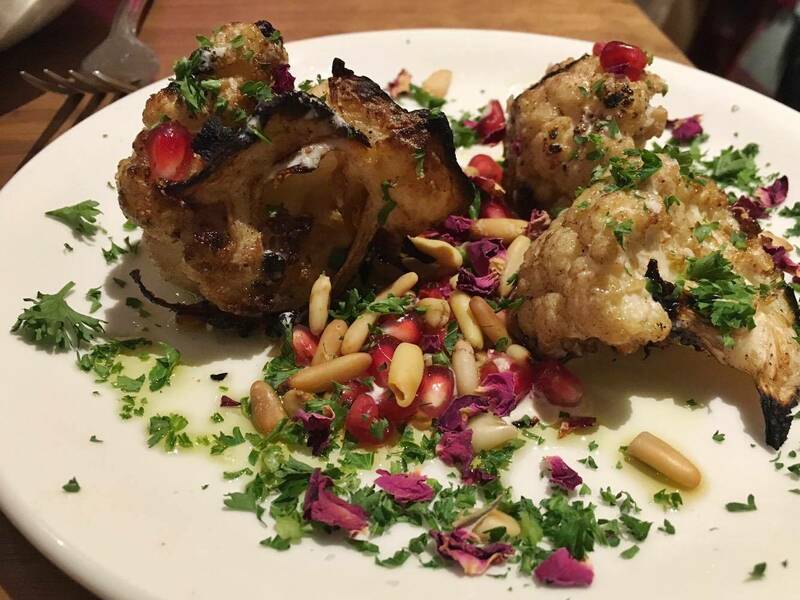 I’ve not got much experience with the full range of sides available, as both times I’ve opted for the Chargrilled Cauliflower, with tahini, lemon & pine nuts – because it was just so damn delicious. The portion size is perfect and is particularly good chopped up and mixed in with the pasta… Presentation wise the dishes looked a little different on the two occasions I went (although to be fair, the second time I asked for the pomegranate seeds to be left off and an addition of basil mayo), but in this kind of place I think that’s fine – when the food is so tasty and fresh and the portion sizes are still the same, it doesn’t both me. On the first visit I also ordered sweet potato fries with the incredible basil (Vegan) mayo which I shared with my mum. I am such a sucker for sweet potato, if I see it on a menu I just have to try it. These ones were very good, neither soggy nor too crispy. If I’m honest, they were probably some of the best sweet potato fries I’ve had! I need to take a moment to stress how imperative it is that you try the basil mayo. It is so so so delicious and completely Vegan. I have the ingredients list saved somewhere thanks to a lovely waitress and intend to have a go making it some time. After perusing the dessert menu the waitress had encouraged my mum & I to look at, we decided to try the Raspberry Ripple Pavlova, which came served with raspberry coulis and whipped coconut cream. Despite feeling particularly stuffed after our substantial meal, this was just the right size to share. 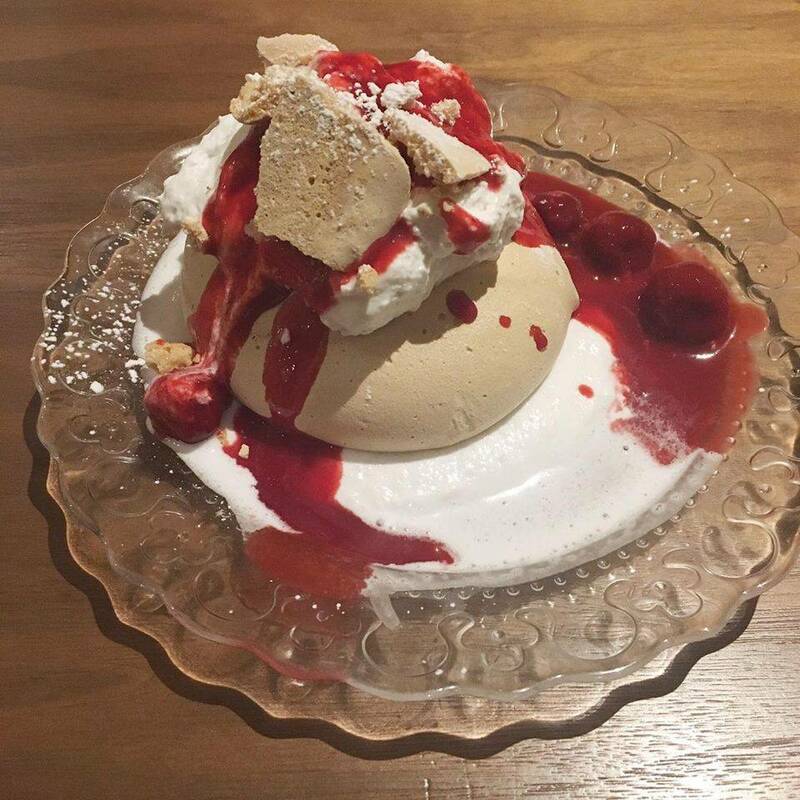 The flavours in the dish complimented each other really well; The raspberry coulis was quite sharp on it’s own, however mixed together on a spoonful with the mouth-watering homemade whipped cream & meringue it was totally delicious. Straight up, the whipped coconut cream is the stuff dreams are made of. Overall I highly recommend visiting this Mildreds if you’re ever in the area. 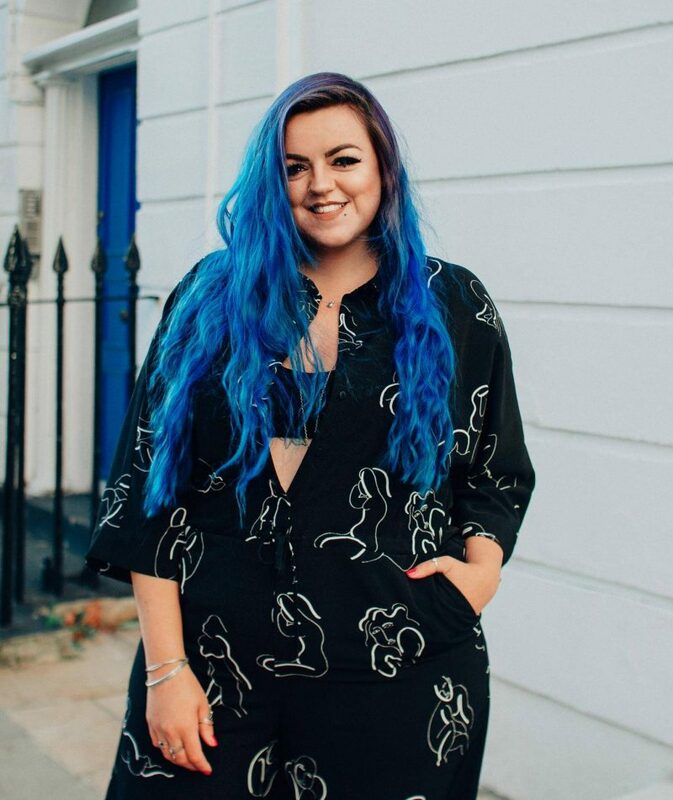 It’s quite reasonably prices for London (especially such a nice Vegan/Veggie place in the heart of Camden) – the whole meal for my mum and I (two glasses of processo, two mains, two sides and one pudding) was under around £40. I hear at lunch time they also have a salad bar & they do takeaway, so if you’re local to any of the locations and fancy some fresh, healthy food, pop by – it’s very reasonably priced for the range of delicious stuff they have on offer! Location wise it’s super easy to get to from Camden station and is on the same road as lots of other restaurants. The staff are all very friendly and helpful – if you’re unsure of any ingredients or have any questions, they’re very happy to help. Inside the space is really nice, with high ceilings and decor is interesting to look at, without being OTT, loud, or distracting. It’s a great place with chilled atmosphere and I will definitely be going again! Even if you’re a meat eater, I implore you to visit this place, I guarantee you’ll be pleasantly surprised. My friend Haydy (Squibb Vicious) is a big meat eater, and wrote a great little review about Mildreds on Yelp if you’re a dubious omnivore. You can see the full Camden menu on their website here! There’s also a Mildreds in Kings Cross which is starting a morning Vegan Breakfast apparently, can’t wait to visit! 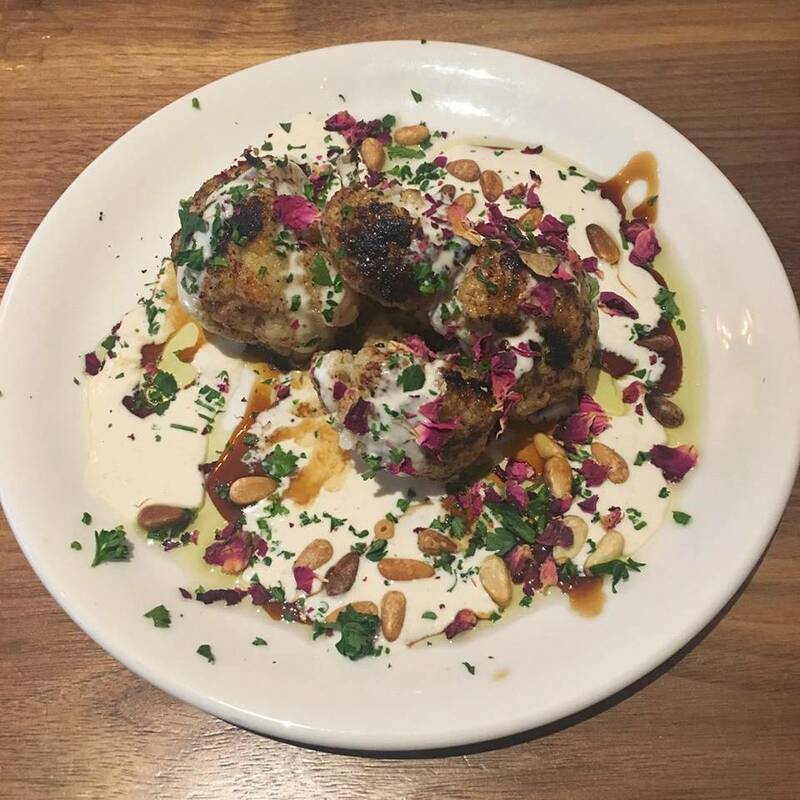 If you enjoyed this blog, check out what I thought of Vegetarian Restaurants: Tibits just off Regent Street in central London, and Iydea on Kensington Gardens in Brighton. Mildreds – just the best I’ve had so far in London for taste, price and service of veggie/ vegan. My lovely daughter will treat me next time I hope !